The group of NUIG students who received sports scholarships at a special ceremony at the college this week. 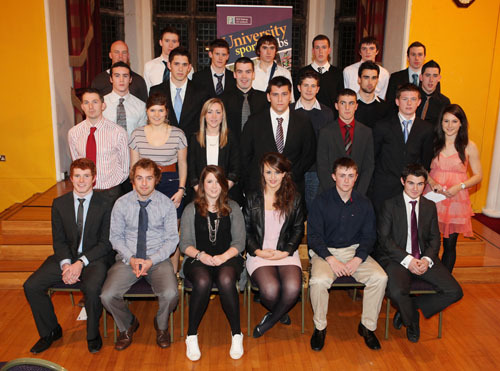 Twenty-four students have received NUI Galway student sports scholarships at a special ceremony this week. Recipients this year include Mayo senior footballers Kieran Conroy and Peadar Gardiner, Sligo’s Stephen Gilmartin, and promising young Kerry forward Ian Galvin. Donegal senior footballer Mark McHugh also receives a scholarship for the first time. Hurling scholarships were awarded to two of the NUI Galway’s Fitzgibbon Cup winning team, Paul Gordon and Barry Daly, who were also part of the Galway u-21 All Ireland final team, and they were joined by the 2010 Galway minor captain Daithi Burke and one of the rising stars of Limerick hurling, Kevin Downes. Three Oranmore-Maree basketballers, Liam Conroy, Colm O’Hagan and Conor Crowley, were awarded for the first time, as was Eddie Mullarky, the youngest member of the NUI Galway National Rowing Championship winning men’s eight. Afric Keogh and Zoe Mannion who have partnered each other in international boats at junior level, also received awards. Other first time recipients include Galway United’s Ciaran Foley and Evan Preston Kelly and Kilkenny camogie senior star Aisling Dunphy. Caitriona Cormican and Ciara Hegarty were recipients of a GAA ladies’ football scholarship. David Byrne was presented with a scholarship for golf, Adam Caulfield for water polo, Colin Collie Smyth for soccer and Sean Wooton for rugby. Two Gaelic football scholarships, sponsored by Cadbury’s for outstanding u-21 footballers as part of its sponsorship of the championship, were also presented to Mayo’s Keith Rogers and Cavan’s Fergal Flanagan. The recipients joined the 30 existing scholarship holders at NUI Galway.